Caution Belt roller hazard symbol and text safety sign. Caution fan hazard warning symbol label. Caution Men working on equipment symbol and text symbol sign. Caution Rotating parts symbol and text safety sign. A-board, caution machine under maintenance. Lightweight, portable plastic board, double-sided, for temporary hazard situations. A-boards. 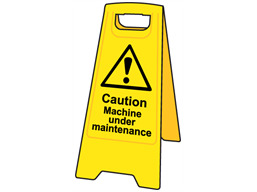 Caution machine under maintenance. Freestanding, lightweight, portable double-sided boards for identifying internal, temporary hazards. NSA19 Board size 480mm x 250mm, with print area 300mm x 200mm. Material corrugated plastic board.